Omnichannel retailing which combines brick and mortar stores, mobile and e-tailing have changed the shopping scene we all are accustomed to. The new generation of tech- savvy customers expects anywhere anytime shopping, pick up and easy returns with tailored personalized offers. Whether they are doing shopping in the store, online, or using a mobile platform, customers expect that they should get a consistent shopping experience across the channels. How retailers can acquire all these capabilities across omnichannel which helps in increasing their operational efficiency? 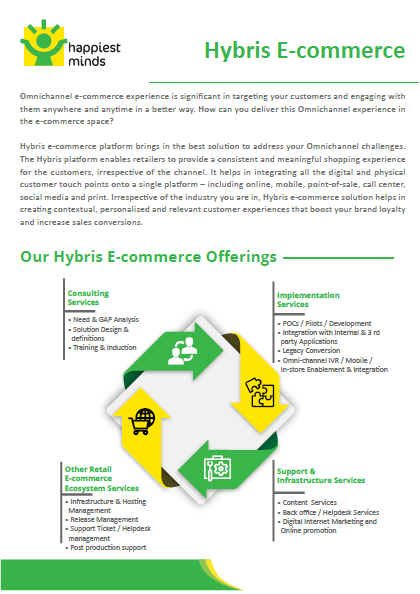 Omni5 solutions from Happiest Minds provide a five faceted approach to accelerate the retail omnichannel adoption and transformation for retail enterprises. Our solution portfolio enables retail enterprises build omnichannel capabilities around Seamless/ Distributed Fulfilment, Connected and Personalized experiences, Integrated Product and Content Discovery, Customer 360 and Segmentation and Digital Infrastructure, Governance and Security. A proprietary consultative framework employed by Happiest Minds retail omnichannel solutions team will find the best way for retailers to enable retail omnichannel transformation by anchoring functional workshops to unearth your business needs, setting the business and technology architecture, proposing an accelerated implementation plan and implementing it. In the age of retail revolution, the customer expectations have changed drastically and they expect consistent digital experience with accurate product information, price and personalized offers consistent across all the channels. The new age retail space demands features like inventory visibility across all the channels, order anywhere, pay anywhere, pick up and return anywhere to provide an augmented customer experience. Retailers expect product identification, customer engagement and analytics across multiple channels for providing consistent product information/ content dissemination across multiple channels. Omni5 solution from Happiest Minds is a five faceted digital transformation solution designed for fulfilling end to end omnichannel requirements of the next gen retailer. It will help retail enterprises transform their stores into mini fulfillment centers with distributed order management. Omni5 focuses on customer identification, engagement and analytics across shopping trips and channels. It will thus enable retailers to shift from big data to better data for improved decision making and omnichannel personalization strategies. Availability of consistent and enriched product and content which can be contextualized and consumed across digital and physical channels is enabled through Omni5’s integrated product information and content capabilities. Finally Omni5 builds on an infrastructure that scales and supports the changing needs of Omnichannel imperatives like enriched content, seamless visibility, personalization in real-time along with strong data security. The new generation of omnichannel retail customers expects shopping anywhere, flexible pick up and easy returns. Physical stores present a great opportunity for retailers to connect with the customers, attract them..
Adobe Experience Manager- a web content management system enables users to create, edit, manage and..